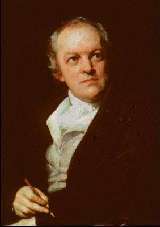 William Blake was an English visionary, poet, painter, and engraver. He hand-illustrated many of his own works. With original thought and creativity, he created a simple and emotionally direct mode of thought and expression. However, he was largely disregarded during his own time and died in poverty. Blake was the second son of five children of James Blake, a merchant of hosiery. James, fearing that his son would be whipped because of his fiery temper, did not send William to school. Instead, he was taught at home, where he became well-read in philosophy. At an early age, Blake began having visions which became the inspiration for his work. He saw God's head at the window and was seized by a fit of screaming. He insisted that he saw angels as he was walking. Once, he told his parents that he'd met the prophet Ezekiel under a tree. Blake had the ambition and talent to be an artist. At the age of 10, he was enrolled at Henry Pars' drawing school. A few years later, he had published Poetical Sketches. His writing shows a strong influence from Jakob Boehme, a German mystic, and the philosophy of Emanuel Swedenborg. At fourteen, Blake studied engraving as an apprentice to James Basire. Seven years later, he was a well-respected and successful engraver. He briefly studied at the Royal Academy of Arts in London, but he withdrew because of conflicts with his instructors. In 1784, he established a print shop. In 1781, Blake was jilted by Polly Wood. He soon fell in love with Catherine Boucher and they married in 1782. He taught Catherine to read, write, and paint. In turn, she assisted him in publishing and supported him through periods of visionary inspiration that often lasted for several hours. Blake perfected a printing process, called illuminated printing, for the publication of his most popular work, Songs of Innocence in 1789. This optimistic work uses childhood to represent Heaven. Five years later, disillusioned with the possibility of human perfection, he published Songs of Experience. Together, these works represent two contrary states of the human soul. True innocence is not possible without experience. In 1800, he met William Hayley, with whom he formed a partnership to illustrate Life of Cowper. He moved from London to Felpham. After the arrangement failed three years later, he returned to London. However, the business he left was gone as well as the money. After a few some unsuccessful shows in London, he became a recluse. He was believed to be crazy, but his work, which broke tradition with the fashion of the time, attracted younger artists. During his lifetime, he was only fully appreciated by fellow artists, many of whom commissioned works from the impoverished Blake. It was only after his death that he emerged as one of the most respected English artists of his time.